Will a Hot Tub Increase a Homes Value? Posted on December 4, 2017 , in Hot Tubs. Unfortunately, there is no concrete answer to this question. There are a number of factors to consider when installing a hot tub and estimating how it will affect the value of your home. However, there are a number of circumstances where a hot tub can increase the property value of your home, increase interest in your listing, and attract more buyers. In the following article, we look at the many different ways a hot tub can help increase a home’s value. If you are looking to have a better estimate of what your installed hot tub will add to your home, try contacting a professional home appraiser. Another option is a real estate professional. They will have a detailed knowledge of the home value trends in your area. They will be able to tell you if other homes have comparable hot tubs. In the case where your home is one of the few, it may help increase the value of your home. However, if hot tubs are pretty common in your area, it may hurt the value of your home not to have a hot tub. Both are important to consider when thinking about installing a hot tub. One important factor to consider when purchasing a hot tub is, will it be portable? If you do end up going with a portable option, it may not add value. The perception buyers are going to have, when looking at your home, is that you will be bringing it with you. Therefore, there is no reason for them to pay more for your home. On the other hand, if you are considering a permanent or in-ground hot tub, which often times are similar to a swimming pool, this has the potential to add real value to your home. If you want to give your home an additional boost in value, consider incorporating a custom patio, decking, or additional outdoor features. This helps improve the appearance of your landscaping and be attractive to potential buyers. A tool that can come in handy when looking to sell your home is the process of staging. When carefully planned, staging can help highlight the best in your home. It show’s a home’s potential to prospective buyers. If you are looking to sell and have a hot tub, consider this powerful selling feature to ensure your hot tub helps your home sell rather than hinders it. If you want to make sure your hot tub adds value to your home, try to keep it in the best condition possible. Think about it from the buyer’s perspective. A worn out, damaged, or cracked hot tub is going to be less appealing than a shiny and clean one that buyers would be happy to jump in. Consider refurbishing the exterior or completing necessary repairs if your hot tub has seen some wear. Lastly, cleanliness is very important and not just right before you wish to sell your home – consistent cleaning will make sure your hot tub stays in great condition. A dirty, unhygienic or improperly maintained hot tub may turn off buyers. If adding value to your home is part of your motivation for installing a hot tub, contact your local hot tub dealer. This expert will be able to provide you with quality models and the best installation options to help you attract future buyers. If you are not planning on leaving your home for several years then sit back and enjoy the numerous health and relaxation benefits of owning a hot tub. You will be investing in your health which will ultimately show up on your finances. 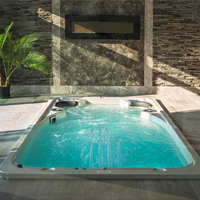 To learn more about the benefits of hot tub ownership, download a hot tub buyer’s guide.